Walk down the aisle in our Ivory Victorian Touring Hat or wear it to your next 19th century inspired soiree. Bustled and cinched, the curvy silhouettes of yesteryear were proudly balanced with the biggest and most beautiful of hats! A potpourri of ornamentations perk up the lace-covered ivory straw form – ooh and ahh over every embellishment including ruched satin, faux flowers, feathers and a long ivory tulle train. Measurements: Inside circumference 22.5 inches brim 4.25 inches, and tulle train 30 inches. Made in the USA. One size fits most. I am pleased with this hat. I volunteer at a State Historical Park that has excursion trains. 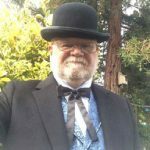 I wear Victorian and Edwardian period clothing and hats. This hat fit right in! The late Victorian hat (ivory) is gorgeous and actually prettier than its picture on the website. The flowers are a very pale pink which matched my dress which also had ivory lace. The hat, lace, feathers, tulle, and other flowers are ivory with some white. It has a long ivory tulle train characteristic of the period. It fits beautifully. Due to the deep crown, it does not blow away in the wind. I had many compliments on it. LOVE, LOVE, LOVE this hat. I plan on wearing it to my birthday tea and it will be lovely. I got it soon after ordering. You are one of my "go to" places for historic styled clothes. The customer service I received from these folks has been phenomenal! Above and beyond any expectations! I cannot say enough good things about this company! You can order with confidence!.. Fantastic company!! !